Exactly who created Karate and when it began is not really known, because the art was guarded secret from outsiders, and no written records were permitted. The location of its birth, however, is known: a small country south of Japan, formerly known as the Kingdom of the Ryu Kyus. Today, it is known as Okinawa. The art of karate in its present form originated in Okinawa, and further developed in Japan and the United States. Historians believe that it probably was a result of combining the Chinese art of Ch'uan Fa (Kung Fu) with an ancient Okinawan art of 'Tode'. Virtually nothing is known about those who created Karate and how it was transmitted because of this secrecy. What little is known is known only due to word of mouth, and even then was kept exasperatingly vague. There were no dojo like there are today and no professional instructors.The famous teacher Matsumura was a military officer serving the Ryu Kyuan king, and Uehara, who is said to have challenged Matsumura to a match, was a metal craftsman. Master Azato, who Funakoshi, Sensei trained under, was a tonochi, a position similar to being lord of a small fief. Itosu, who Funakoshi learned the Heian, Tekki,and other kata from, was the private secretary to the Ryukyuan king. This custom of secrecy persisted in Okinawa until the 1950's. This helps explain why there are such widely different variations in what was originally a single kata. In addition, there is always the potential problem of a student's misinterpreting a kata, thereby altering its transmission and causing distortions. This practice is not confined to Karate; Kendo and many other martial arts share this characteristic. However, the others pale in comparison to the great lengths taken by the Ryu Kyus to guard their art; which included a self-imposed ban against keeping written records. In the Meiji period [1868-1912],when the need for concealment no longer existed, the centuries-old tradition of keeping Karate practice and instruction secret remained deeply rooted among the people. When people hear the term "martial arts" they generally think of Karate. One of the most popular martial arts, Karate had its roots in China, developed in Okinawa, and modern Karate was later brought to Japan by Gichin Funakoshi, Kenwa Mabuni, Choki Motobu and Chojun Miyagi. Karate originated in Okinawa in the 1600s. It was developed from imported Chinese martial arts skills and refined as an advanced means of self-defense because weapons were outlawed on the island. It was originally called Te, meaning "hand." Later, masters adopted the name Karate, meaning "empty hand" or "Chinese hand" (depending upon which characters are used to write the word). The word Karate is formed by two characters, the first one 'kara' (empty) and the other 'te' (hand). Kara may be explained sever always. The first way is that through the practice of karate, self-defense techniques are learned, where no weapons are used, other than hands, feet, or other parts of the body. A second way, as explained by Master Funakoshi, "Just as it is the clear mirror that reflects without distortion, or the quiet valley that echoes a sound, so must one who would study Karate-do purge himself of selfish and evil thoughts, for only with a clear mind and conscience can he/she understand that which he/she receives. This is another meaning of the element kara in Karate-do." Another meaning given by Funakoshi is that of always striving to be inwardly humble and outwardly gentle. Finally, Funakoshi also talks about the elemental form of the universe, which is emptiness (kara, ku),"and thus, emptiness is form itself. The kara of Karate-do has this meaning." It is clear that Karate is much more than mere self-defense techniques. Toward the end of the 19th century, Gichin Funakoshi trained with various karate masters, and then devised his own system, which he named Shotokan. He spread the style to the Japanese mainland and eventually to the West. Master Funakoshi, inspired by traditional martial arts from the main Japanese islands (such as Kyudo, Kendo, and Judo) modified Karate,which until that moment could have been called Karate-jutsu (a fighting art), and emphasized its philosophical aspects combining Karate techniques with traditional Budo (the martial way). The word Budo is formed by two Chinese characters. Bu is formed by two symbols, a symbol that means to stop is drawn inside another symbol of two weapons, two crossed halberds. Thus, bu means to stop conflict. As mentioned before, 'do' means a way or a life philosophy. In Master Funakoshi's own words: "Since Karate is a Budo, this meaning should be deeply considered, and the fists should not be used needlessly". In 1892, Ogawa Shintaro, the Prefectural Commissioner of Education, invited Master Itosu to attend a meeting of school principals and to lead his students in a Karate demonstration. The ministry immediately recognized the value of Karate-Do training and granted permission to include Karate in the physical education programs of the First Public High School of Okinawa and the Officer's Candidate School. This was probably the first time that Karate-Do could be openly practiced,but as implied above, the need for secrecy was still very much ingrained in the teachers even then. In May of 1922, Funakoshi was asked to introduce Karate to Japan at large at the First Annual Athletic Exhibition, held in Ochanomizu. The demonstrations were very successful, and Funakoshi spent a lot of time traveling to demonstrate and teach Karate-Do to all who asked him to do so. This is when Karate truly became wide spread as a martial art. After this time, Kenwa Mabuni began his many trips to Japan in an attempt to spread his knowledge of the art. In 1928, he moved to Osaka, Japan and started teaching there. Around the same time, the Butoku Kai (the governing body for martial arts in Japan at the time) started registration for all Karate schools. In 1936 Ryukyu Shimpo,an Okinawan newspaper reporter, sponsored a meeting with Okinawan Karate masters to discuss the status of Karate in Okinawa. Yabu, Kiyamu, Motobu, Miyagi, and Hanagi were invited to Naha, the capital city of Okinawa and also the "Mecca" of the Karate world at the time. In this meeting, the unification of writing was discussed and it was decided to change the name of the art to "Karate"meaning "empty hand". In Okinawa 3 separate styles or Te emerged. These styles are named for the regions in which they were developed. The styles are Shuri-Te, Tomari-Te, and Naha-Te. The differences in these styles suggests influences from various Chinese styles. Shuri-Te seems to have incorporated the external system of Shaolin boxing,while Naha-Te incorporates internal Taoist techniques (possibly Hsing-I or Pa-kua influence). Tomari-Te seems to have had a mix of both internal and external styles.The Chinese arts were made and adopted uniquely by the Okinawan people and are thus a separate martial art stylistically. Karate styles formulated in Japan are all derivatives of the earlier Okinawan systems, though influenced by jujutsu, samurai bujutsu, and Chinese and Korean fighting arts. There are presently four or five major styles, numerous minor ones, and countless spin-off styles. Chito Ryu: Dr. Tsuyoshi Chitose (1898 - 1984), also known as as Chinen Gua in Okinawa, was the founder of Chito-Ryu Karate. Born in Kumochi, Naha, on October 18th, 1898 Dr. Chitose created Chito-Ryu after spending years studying both Shorin-Ryu and Shorei-Ryu. He became 10th degree black belt and Head Instructor of Chito Kai of the All Japan Karate Do Federation. Chito Ryu Karate training is based on Kihon (basics), Kata (form) and Kumite (fighting) practice. Its basic Kata are Shiho-Hai, Niseishi, Seisan, Rohai, Bassai and Chinto. Its main stances are seisan-dachi, shiko-dachi, kosa-dachi, uchi-hachiji-dachi and sanchin-dachi. Goju-Ryu, which was founded by ﻿Chojun Miyagi﻿ (1888-1953). Its popularity due to the success of Kanryo Higashionna (1853-1915). Higashionna opened a dojo in Naha using eight forms brought from China. His student, Chojun Miyagi founded Goju-ryu, 'hard soft way' in 1930. In Goju-ryu much emphasis is placed on combining soft circular blocking techniques with quick strong counter attacks delivered in rapid succession. It came from Shorei-ryu (from Naha-te and Tomari-te), which utilize up and down stances and internal breathing power (known as "hard and soft" techniques). Kata such as Sanchin (Naha-te) and Rohai (Tomari-te) demonstrate this techniques well. Japanese Goju Kai: Also popular in Japan is The Japanese Goju-Kai, founded by Gogen "The Cat" Yamaguchi. The word kai means organization, thus Goju Kai refers to the Organization of Yamaguchi, or the Organization of Master Gogen Yamaguchi. Yamaguchi blended the Okinawan goju-ryu of Chojun Miyagi, with Chinese techniques, yogam and Shinto elements. His innovations created a typically Japanese style of karte-do. While Yamaguchi's claims to seniority in the goju worldwide organization. Among Yamaguchi's senior students were Shojo Ujita, Tomoharu Kizaka, Kenjo Uchiage, and Yamaguchi's three sons, Gosei, Gosen, and Goshi. Isshin-Ryu (one heart/one mind) was found in Okinawa in 1954 by Shimabuku Tatso by combining Shorin-ryu and Goju-Ryu techniques. Sensei Shimabuku trained in both Shorin-Ryu and Goju-Ryu systems; trained in Kobayashi-Ryu under Chotoku Kiyan and later under Choki Motobu. Then He studied the Bo, Sai and Tonfa under Okinawa's most noted instructors. Isshin Ryu is a combination of the best of these styles and weapons techniques and epitomizes the powerful, lightning-fast techniques that enabled the weaponless Okinawans to endure the rein of the Chinese empire and to defeat the sword-wielding Samurai of Japan. It uses low kicks, short stances, and awareness of surroundings to be useful for street fighting. It also teaches use of the kusarigama. Kyokushin is a Japanese style of Karate founded by Oyama Masutatsu in the 1950's. Mas Oyama was born in South Korea in 1923. Oyama, a student of Korean Goju-Ryu master So Neichu, of Gogen Yamaguchi, and Funakoshi, combined what he learned from these masters with his knowledge of Korean fighting arts (he was Korean by birth), and with certain Chinese techniques and strategies. He began his martial arts study at the age of nine, when he was in China. He later moved to Japan to train as an aviator, and studied boxing and Judo. He studied karate under Gichin Funakoshi, and achieved the rank of 4th dan, to go with the same grade in judo. After the war, he studied under So Nei Chu, who was himself a student of Chojun Miyagi, the founder of Goju Karate. The style was influenced by Kempo, Goju Ryu, and Zen. It is powerful art that emphasized breaking, breathing, multiple attacks in quick succession, and killing techniques. Kyokushin Karate is characterized by requiring of its participants, strenuous training, conditioning and realistic contact while sparring. The International Karate Organization and the Kyokushin-kaikan follow the Karate way of building character and training the mind and body to contribute to society, based on Sosai Mas Oyama's Kyokushin spirit "Keep your head low (modesty), eyes high (ambition), mouth shut (serenity); base yourself on filial piety and benefit others". Oyama, one of the most famous karate masters in the world, popularized karate through spectacular tests of strength such as killing bulls barehanded and winning public challenge matches against pro wrestlers. Shuri-Ryu has the longest unbroken history of any system of karate, and its origins can be traced back to Taishi Bodhidharma, who was the founder of Zen and of karate, in the 6th century. Shuri-Ryu karate is known as the ancient karate of Okinawa, whose greatest exponents were masters Sokon Matsumura, Ankoh Itosu and Choki Motobu. Another master who furthered the development of Shuri-Ryu karate was the Chinese master Shang Taso Hsiang, who integrated the internal Chinese systems of Hsing-yi, Pakua and Chuan-fa (kung-fu) with the external systems of Shaolin-Chun, Chuan Pei and Hung Kun. 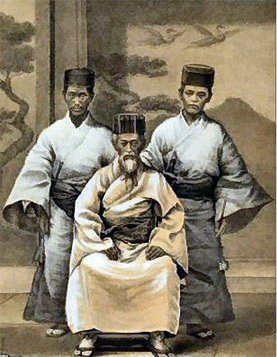 The elder Hsiang left his knowledge to his nephew, T'ung Gee Hsiang, whom he had raised from early childhood. During a time when T'ung Gee Hsiang was living in the Chinese Settlement of Kume Mura in Okinawa, he was approached for his martial arts knowledge by the greatest Okinawan master of this century, the legendary Choki Motobu. Hsiang and Motobu shared their knowledge and the incorporation of their two noble styles became the entirety of the Shuri-ryu system as taught today. From Okinawa T'ung Gee Hsiang traveled to the Solomon Islands as a missionary. There, in 1942, he met with Robert A. Trias, a young American serviceman who was middleweight boxing champion of the U.S. Navy. Following a now famous exchange, between the two men Trias began training in Hsing-yi and Shuri karate-kempo under Master Hsiang. Later during the war, he was also able to train with Hoy Yuan Ping in Singapore (1944). Ping was a Cantonese master who had been associated in the realm of the martial arts with Hashinosuka Fukuda, of the Tenshin Sinjo school of Kempo ju-jitsu in Japan. When the war ended in 1945, Trias returned to the United States and was the first to introduce karate to America. He opened the first karate school in 1946 and formed the United States Karate Association in 1948. Shorin Ryu. Shoshin Nagamine is the present head of matsubayahi Shorin-Ryu (pine forest Shorin style). Nagamine had studied with Ankichi Arakaki, Chotoku Kyan, and Choki Motobu. His system is chiefly distinguished from the others by a typically faster, lighter movement; the kobayashi style emphasize more power and less mobility. Shorin Ryu is an Okinawan soft style. Known for its light, quick, and agile techniques that are suitable for a person of light body structure. Because of its strict spiritual aspects it is considered a religious sect. Shorinji Kempo is a Japanese Martial Art founded by Doshin So after the Second World War. Shorinji Kempo is a Japanese Karate style that is deeply rooted in Zen meditation. It was created by So Doshin who said that it was based on traditional Shaolin teachings. Doshin So worked and studied in China, and when he returned to live in Japan, he established his school based on the techniques he had learned there. Broadly speaking, it can be described as a mixture of Karate, Aikido and Judo, with the main emphasis based on defense and evasion. Shorinji Kempo also teaches that the body and the mind are inseparable, and that the two entities should be trained by the practice of Kempo and Zen meditation, in a sitting (Za-zen) position. It stresses being calm in action. Shorinji Kempo trains both mentally and physically, promoting the learning and understanding of ourselves and others. Students first learn its deep spirituality, then learn the fighting techniques. Because of its combination of Buddhism, philosophy, and martial arts, many consider Shorinji Kempo a religious sect. In the 1970's, the Japanese courts forced So Doshin to the change the name of his school to Nippon Shorinji Kempo. Shito-Ryu: In 1928 Kenwa Mabuni (1887-1952) came from Okinawa to Osaka and established a style he called Shito-ryu. The name Shito is constructively derived from the combination of the Japanese characters of Mabuni's teachers' names - Yasutsune "Anko" Itosu and Kanryo Higa'shi'onna. Shito-ryu employs kobu-jutsu (art of weapons) and a balance between hard and soft techniques. It was influenced directly by both Naha-te and Shuri-te (Shorin-ryu and Shorei-ryu). Shito-ryu is fast, but is still powerful and artistic. Shito-ryu schools use a large number of kata, about fifty, and is characterized by an emphasis on power in the execution of techniques. Its kata include the same kata as Shotokan-ryu and Goju-Ryu, as well as some artistic Chinese white crane kata such as Nipaipo. Shito-ryu also practices with Kobudo (weapon arts) and sometimes Iaido (sword arts) as part of the style, which makes Shito-ryu fairly unique among the modern Karate styles. Shorei Ryu is an Okinawan hard style. Known for its heavy, powerful techniques and body toughening training. It is known for the numerous amount of stances it uses. It is more suitable for a person of heavy body structure. It strives to emulate the actions of the 5 traditional animals and teaches all the traditional Okinawan weapons, such as the bo, tonfa, and sai. Shotokan is the "authorized" Japanese style of Karate, which was founded by Gichin Funakoshi in Tokyo in 1938. Gichin Funakoshi, considered to be the founder of modern karate. Born in Okinawa, he began to study karate with Yasutsune Azato, one of Okinawa's greatest experts in the art. Shoto was the pen name of Funakoshi. In 1921 Funakoshi first introduced Karate to Tokyo. This style was one of the first styles to be introduced to Japan in the 1920's. In 1936, at almost 70 years of age, he opened his own training hall. He combined Shorin and Shorei to a style that would accommodate all body structures. Shotokan is a "hard" style that is a true "empty hand" art", and is characterized by powerful linear techniques and deep strong stances. Shotokan training emphasizes mastering a few techniques rather than learning many techniques. It does not include weapons training. Powerful kata such as Bassai (Shuri-te) are typical of this style. In time, people who trained in Karate were not only known for practicing Karate but also began to be related to different "styles", even though Gichin Funakoshi was against this idea. His students began to be known as of the "Shotokan", the place where they trained, or "Shotokan-Ryu", the Shotokan Style. In 1949 the Japan Karate Association (JKA) was founded; Funakoshi was chief instructor. This organization established strict standards for instructors and members. Moreover, in 1955, it began sending these superbly trained instructors abroad to establish clubs in other countries. The JKA was headed for many years by chief instructor Masatoshi Nakayama. Shotokai Karate-Do is the true discipline of karate-do and was established over 80 years ago by the originator of modern karate-do, Gichin Funakoshi. Shotokai Karate-do is a non-competitive style of Karate derived from Gichin Funakoshi's Karate by Masters Yoshitaka (Gigo) Funakoshi and Shigeru Egami. The Sho character is taken from the word matsu which means pine tree. To is the character for waves. Pine Waves is the English translation that tries to express what the original Japanese kanji represent, the sound that is produced by the pine needles when the wind blows through them, a sort of wave sound. Gichin Funakoshi, used Shoto as a pseudonym when he signed his poetry works. Kan, means building or house, thus Shotokan is the house or building of Shoto. Shotokai does not consider Karate a sport so it avoids all type of competitive tournaments. Rather, it stresses Karate as a Budo art that is concerned with personal development through the study and practice of Karate as a Do, a Way of Life, and the development of the internal energy, Ki. Shotokai movements are full of vitality and energy, but they use the principles of harmony and relaxation and avoid the use of brute force. Each Shotokai student in a group, has his or her own way of attaining mind-ki-body unity, in a way that permits all students to learn from each other. In a training atmosphere void of distinctions, communication grows and mutual respect arises unhindered. Shotokai and Shotokan are two names for the same thing. 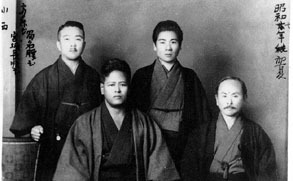 Shotokai is the name of the Organization established in 1935 to raise funds for the building of Funakoshi's Main Training Hall. After Master Gichin Funakoshi's death in 1957, Shotokai was heir of his symbol (O-sensei's Tiger), the Shotokan and Shotokai names, and more importantly all his documents and writings. Shotokai's headquarters in Japan is still the Shotokan Dojo, a though it has been reconstructed since the original one burned during a World War II bombing. Uechi Ryu: A traditional Okinawan, Zen based style founded by Uechi Kanbum. Although it has become one of the main Okinawan martial arts and absorbed many of the traditional Okinawan karate training methods and approaches, it is historically, and to some extent technically, quite separate. In 1987, Uechi Kanbun, an Okinawan, went to Fuzhou, the capital city of Fujian province in China, to avoid being drafted into the Japanese army. He studied under master Zhou Zihe for ten years, finally opening his own school, one of the few non-Chinese who ventured to do so. Absorbing some Okinawan Goju-Ryu over the decades, it still retains its original Chinese flavor, both in its technique and in the culture of the dojo. It is a "half-hard, half-soft" style very similar to such southern Chinese styles as Fukienese Crane (as still practiced in the Chinese communities of Malaysia), Taiwanese Golden Eagle, and even Wing Chun. Conditioning the body for both attack and defense is a common characteristic of both Okinawan karate and southern Shaolin "street" styles, and as such is an important part of Uechi training. There is a strong internal component to the practice, including focused breathing and tension exercises similar to Chinese Qigong. Uechi, following its Chinese Crane heritage, emphasizes circular blocks, low snap kicks, infighting (coordinating footwork with grabs, locks, throws, and sweeps), and short, rapid hand traps and attacks (not unlike Wing Chun). The style incorporates the characteristics of the Wushu animals. It uses circular motions and uses the Phoenix Eye single knuckle punch. Unlike most Karate styles, it uses grappling techniques. Wado-Ryu was founded inthe 1939 by Otsuka Hidenori, one of Funakoshi Gichin's students.The full name of the style is Wado-Ryu Karate-Do, the term Wado-Ryu means "school of the Way of Harmony", indicating Ohtsuka Sensei's original intention to use training in Wado-Ryu as a means of solving problems in a non-violent way. Karate-Do means "way of the empty hand", as Karate is, for the most part, studied without the use of weapons. Ohtsuka studied Ju Jutsu for many years before becoming a student of Gichin Funakoshi, considered by some to be Funakoshi's most brilliant student. Trained in classical bujutsu (the techniques of the samurai), Sensei Ohtsuka applied this outlook and experience to his teachings. Ohtsuka combined the movements of Jujutsu with the striking techniques of Okinawan Karate, with a strong focus on evasion through body shifting. Sensei Ohtsuka rejected hardening certain parts of the body, such as hand conditioning, as useless preparation. Some of the harsher resistive or hard contact elements of sparring technique, typical of many karate styles, are not present in Wado. U.S.A. Goju Ryu: Sensei Peter Urban formed this system in 1966. Mr. Urban, an American citizen, who had studied Karate in Japan after the war under Richard Kim, Mas Oyama and Gogen Yamaguchi. He came back to the United States in 1959, bringing the Hard/Soft style of the Goju Kai with him. Peter Urban was introduced to Gogen Yamaguchi and Mas Oyama, Sensei, where he was accepted into the Goju Kai as a student. In 1957, Peter Urban opened a small Dojo in Tokyo, and competed in the all-Japan College Championships that same year. In 1959 Urban return to the United States and opened his first American Karate Dojo, in Union City, N.J. The following year, he opened another school on 17th street in Manhattan. Peter Urban was reportedly one of the men responsible for establishing structured tournaments in America, one of the first of those being the North American Karate Championships in 1962, held at Madison Square Garden. Three years later, at the age of 31, Urban's first book; The Karate Dojo, was published. Urban opened his famous Chinatown Dojo in 1967, making Japanese karate open to the public. However, it was in 1966 that Urban returned to Japan to ask of Gogen Yamaguchi permission to establish in America, a karate system separate from Japan's. Yamaguchi refused, saying the rules of Bushido stated that no white man could achieve Nirvana. Urban, dissatisfied with the decision, retorted that these same rules stated that Japan could never lose a war. This statement offended the Sensei. Realizing this, Urban prepared to follow samurai custom, to cut off his pinky finger in apology. Urban separated himself from the Goju-Kai hierarchy in Japan and established his Dojo in the Chinatown district of New York City and began training his own students in this Okinawan-derived martial art. Urban kept what was traditional from the style, the training methods and Kata, use of Japanese terminology, the philosophy of karate, and even the emblem of his Master, Yamaguchi's fist. He adopted the black Gi training uniform as a visible demonstration of his disassociation with the Japanese organization. He assumed the rank of Tenth Dan, and called his style of Karate "Urban Goju". The system has since become known as U.S.G.A. "United States of American Goju Association". Nisei Goju Ryu was co-founded in 1969 by Sensei Frank Ruiz and Sensei Harry Rosenstein. Ruiz earned a chestful of medals including the Purple Heart, Silver Star,and Bronze Star during the Korean War. Upon his release, Sensei Ruiz became one of Peter Urban's first students in 1960. Ruiz was already a master level practitioner in Judo and Karate instructor, tournament competitor when he met Sensei Peter Urban. In 1970 Ruiz cheated death after being struck by a car traveling 80 m.p.h., managing four years later to walk normally and practice Karate again. During the 1960s and 70s Frank Ruiz assembled and trained many Karate stars in the United States. Some of them are Louis Delgado, Malachi Lee, Ronald M. Taganashi, Thomas "La Puppet" Carol, Chaka Zulu, Earl Monroe, Herbie Thompson, Bill Wendell, Elsie Roman, Gaynor Cote, Wilfredo Roldan, Owen Watson and Ron Van Clief "The Black Dragon". The Chinese Goju System was founded by Grandmaster Ron Van Clief on January 25, 1971. Grandmaster Van Clief is a disciple of "Sensei" Peter Urban, Sensei Frank Ruiz of Nisei Goju Prof. Moses Powell of Sanuces-Ryu Jiujutsu, Prof. Remy Prisas of Arnis de Mano and Leung Ting of Wing Chun. After many years of study in the arts of Karate, Ju-Jutsu, Aiki-Jitsu Zen-Jutsu and Kung-Fu. Grandmaster Ron Van Clief wanted to combine and merge the Goju system closer to its Chinese roots. Not an easy task due to the distinct ideologies of the Japanese, Chinese and American cultures. He combined the soft aspects of his Chinese arts training, with the hard and soft characteristics of Japanese Martial Arts as well as the ancient art of Aikijitsu. Chinese Goju International, is an organization of dedicated martial artists whose primary goal is to further the Martial Arts while preserving the unique heritage and traditions of thier time honored arts. C.G.I. 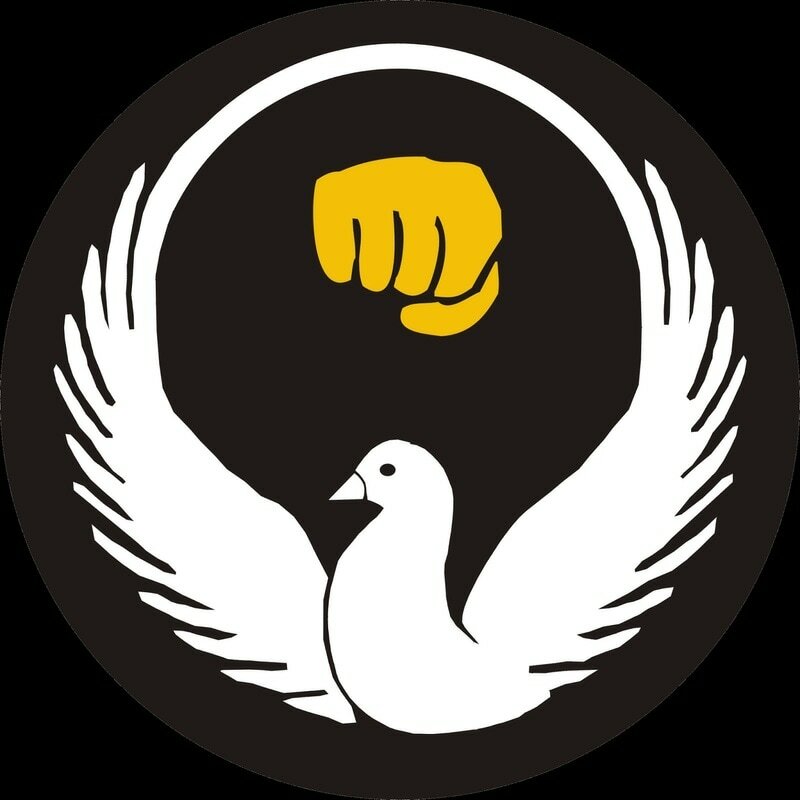 is an Independent Martial Artists Association dedicated to the advancement of all martial arts education without the politics. The Association is committed to providing all levels of training resources and support to its members and affiliated schools. Membership in C.G.I. assures open access through an international network of instructors and practitioners dedicated to their advancement and education. Instructors world-wide retain complete control over their operations while receiving the resources, support and international recognition they deserve. Membership is open to all dedicated Martial Artists with a sincere desire to help themselves and others.